Please find an action to open the IOS keyboard and get the inputed text. It's tested on IOS, but not on android, should work tho. I have tested it on an android device and the default keyboard doesnt work, this I was actually expecting so I don't think its an issue, the ascii keyboard setting looks like it should work as it comes up on screen. I am having an issue, currently testing it on android as stated above. if you use the input properly once and close it using the done button the fsm responds as expected however when I try to re-open the on screen keyboard the text field goes back to the inputed text as expected however the on screen keyboard doesnt show with the same issue as touching off the keyboard. This sounds like that they keyboard is being drawn behind the game and it can not be accessed any more, though this is a guess as I do not know how to get any more debug info out other than writing text to screen. the functionality works perfectly though, I can input text and pass it on! so a big thanks for the action so far! I unfortunately do not own or have access to any android devices... if you can provide me a code that make the keyboard behave like you want, send it to me and I'll try and match it. I will ask over at the unity forums but I have made a few observations, might point you in the right direction. so after reading the comment about the active event, I used this to see when the state was active by posting text to screen, then on exit posted another comment. so first open and close works as expected, the second time it goes to the "on screen keyboard state" the keyboard does not activate this time around and stops in that state, again game is still running, showing the fps counter I have placed on the UI changing as expected. further more to the first post when minimising the keyboard and touching of screen on anywhere but the keyboard, pressing the back button (mapped to escape) on the device the keyboard seems to properly close and the game returns to normal. this seems to support the idea that the keyboard is being rendered behind the game at this point and as such is a bug with unity? try no to use the active event at all, and see if it performs? maybe this is the problem. thanks for the suggestion but unfortunately it makes no difference. the gods are smiling on me today! Android: Made sure OnScreenKeyboard can be opened again after being closed due to lost focus. might be part of the issue, I have yet to test it, but it makes me happy that there is a chance . will update here once I got the new version tested and all that. Hey, very good news! hopefully this was the bug you had indeed. well I finally got around to testing this, many problems this week! anyhow, good and better news here. the issue was then that this script would not re-open the keyboard for a second time, so after many different solutions that failed I commented out the if keyboard == null. so I then commented out all the private bool stuff in the script and after 2 hours of messing around got the script to work, im not entirely sure what the private bool tests where for. at the moment I have only done a simple test with 1 input type and field etc, what does the private bool effect, will I have an issue if I open a different type of keyboard. also when I re-open it the keybaord it has the old text, this is a minor issue but is there a way to reset the text to the place holder text with a bool option in the action. Good, I also found out that on IOS, if you close the keyboard with the bottom left button, then the top bar with the text input and done button stay up... crap.... so the user need to hit the "done" button instead, haven't really got to the bottom of this one, but just found out while testing something else actually. 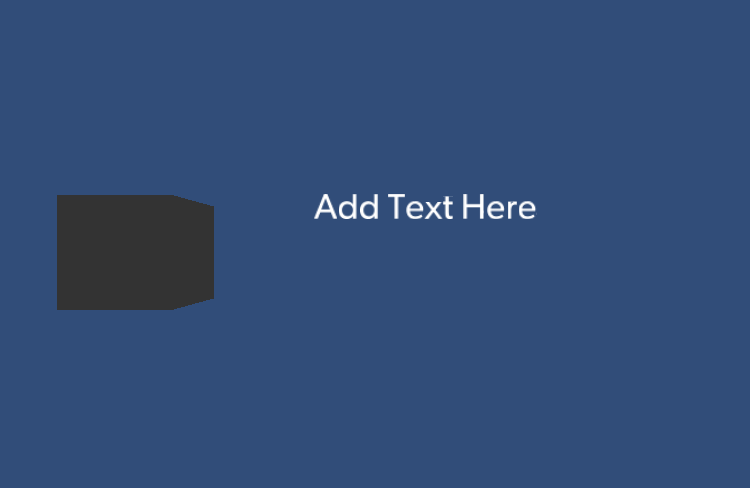 I just added this action and I am trying to use it with the tk2d textmesh. 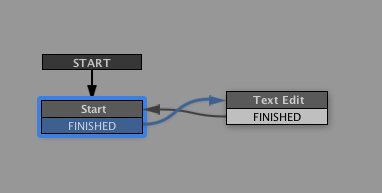 I have a text variable that is being changed when I click on an object. It works once, updates the text var and then closes the keyboard. I want to be able to touch it again. When you do touch on then object again The even fires, but the keyboard does not come up again. It only comes up the first time. Any Ideas? sounds similar to my issue however jean says he hasn't had an issue on the iphone/pad as such I would suggest not sending the active to an event, leave it blank and see if that fixes your issue. yes, sJones is correct, try without wiring the active event first. Works GREAT!!! Thanks so much! Hey, this action works great but is there any way to stop it from preventing a build to PC/non-mobile? 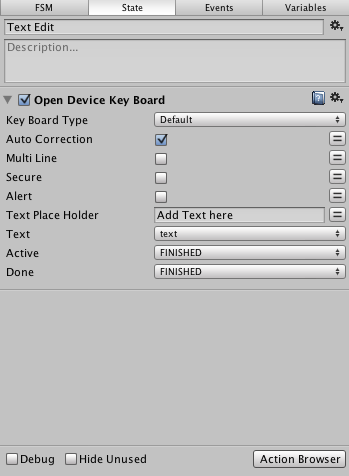 Assets/PlayMaker Custom Actions/OpenDeviceKeyBoard.cs(12,24): error CS0246: The type or namespace name `TouchScreenKeyboardType' could not be found. Are you missing a using directive or an assembly reference?